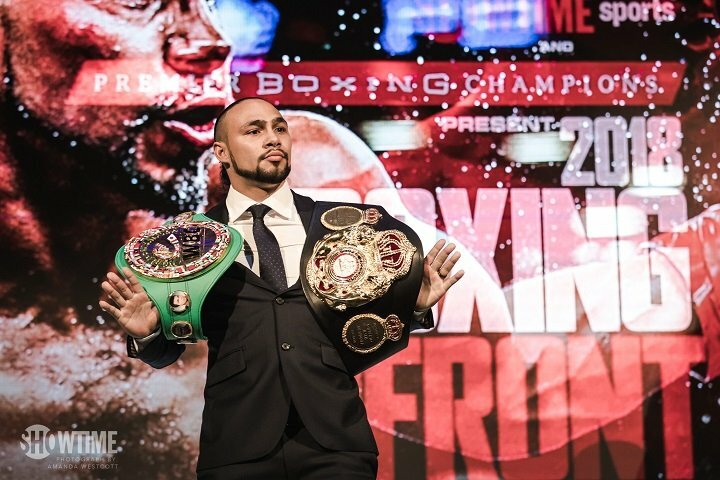 By Dan Ambrose: Paulie Malignaggi feels like it’s too soon to make the unification fight between IBF welterweight champion Errol Spence Jr. (23-0, 20 KOs) and WBA/WBC champion Keith ‘One Time’ Thurman (28-0, 22 KOs) for 2018. Malignaggi thinks the boxing fans should let Thurman heal up from his elbow injury and slowly work himself back to where he’s a 100 percent healthy before he faces Spence in 2019. Thurman is currently out of action due to a new injury to his left hand. That problem is supposed to be healed by the summer. Thurman was scheduled to fight on May 19th before he suffered the hand problem. At this point with Thurman’s constant injury problems that have been affecting him since 2016, he’s no longer reliable. Spence is going to be moving up to 154 soon, as he’s a fighter that walks around in the 170s. He might not be able to hang on long enough for the 29-year-old Thurman to stop licking his wounds to get healthy enough to start fighting again. Thurman seems like he’s aging fast. With the way that Thurman is chronically injured, it doesn’t pay off for Spence to wait until 2019 for a fight against him, because if he does that, there’s a good chance that he’ll have a new injury that he’ll be dealing with. Thurman isn’t fighting enough to increase his popularity in the sport, so there’s no point in Spence waiting to fight him for the sake of making the fight a bigger one. It’s not going to get any bigger if Thurman is only capable of fighting one time per year. We don’t even know if Thurman will be able to fight at all in 2018. Right now, Thurman is thinking he’ll fight in the summer, but there’s no telling right now if he’ll be able to do that. The question is what happens next year if Thurman is still dealing with injury problems. Does Malignaggi say that the Thurman-Spence fight should be put off until 2020 and then 2021? The problem with Malingaggi being Thurman’s enabler is that it only gives him confidence to keep putting off his fight with Spence until he’s 100 percent, and with his injury problems, he may never reach that physical and mental state again. Before Thurman’s latest injury, he was talking about 2018 being his get back year. Once Thurman starts fighting, he’s going to have his mandatory defenses due for his WBA and WBC belts. If Thurman is only capable of fighting once a year, then Spence could wind up waiting until at least 2020 before he gets a fight with him.